An interesting account of the first World Series home run – hit in 1884 by Jerry Denny of Providence. In March of 1921 the Yankees held spring training in Shreveport, Louisiana. This article examines the Babe’s pre-season as well other spring training events. Newark’s Bob Seeds hit seven homers in two games in 1938. The last time Lou Gehrig's name appeared in a box score. Few people realize that when the New York Highlanders changed their name to the New York Yankees in 1903, they played in New Orleans as the Yankees before they ever played in New York as the Yankees. An account and box score of the Opening Day game in 1901 for the New Orleans Pelicans in the newly formed Southern Association against Memphis. Larry Gilbert’s debut season as the manager of the Pelicans was a real winner. An overview of the career of New Orleans native Connie Ryan. The first native New Orleanian to play major league baseball is recounted here along with the box score of the game. A list of players who achieved an unusual feat -- they hit a triple, then stole home! A tribute to the late Pel Hughes contained in an account of the most lopsided victory by the New Orleans Pelicans. The longest opening day contest on record was between the New Orleans Pelicans and the Birmingham Barons on April 10, 1953. A total of fourteen players from New Orleans teams have led the league in roundtrippers from 1887 through the 2003 season. New Orleans native Lenny Yochim's brief career in the Pacific Coast League in 1955 resulted in a perfect batting average. Night baseball finally came to New Orleans on May 15, 1936 and is remembered here by Arthur O. Schott. The box score of the game is also presented along with a photograph of the Pelicans dugout courtesy of Mrs. Helen Gilbert. Before there was Babe Ruth there was Perry "Moose" Werden -- a power hitter before it became commonplace. A look at the life of Johnny Dobbs, one of the greatest managers in the history of the New Orleans Pelicans and the Southern Association. A comparison between two of the greatest left-handers in Boston Red Sox history -- Babe Ruth and New Orleans' own Mel Parnell. 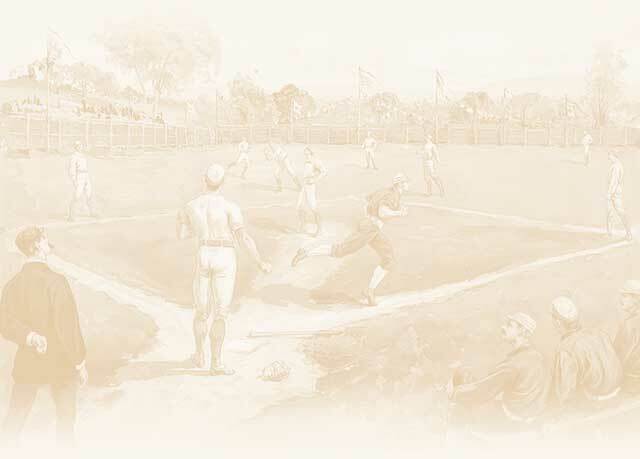 The first pitcher's duel in baseball occured between George Bradley and Albert Spalding in this game account covered by baseball historian Arthur O. Schott. One of the rarest feats in all of baseball is to see a player hit four home runs in a single game. A unique look at those power hitters who were also less likely to strikeout. Do not look for Reggie Jackson's name here. The most prolific right-handed hitter in the history of baseball. An uncanny and unbelievable game from June 8, 1869 which saw Niagara defeat Columbia by the score of 209 – 10. A revealing analysis of the home run records of Babe Ruth and Hank Aaron. The rarest play of all – the unassisted triple play – is examined (current through the 2003 season). Comparing the records of the city's professional baseball teams. New Orleans veteran baseball historian compares the baseball careers of two native sons. Written in 1977 at the beginning of the season as an introduction for baseball fans for the return of the Pelicans. A brief description of the event along with the box score from the game. Betcha you never even heard of anything like this! Although written in 1969, this piece is very timely given the passing of Gene Freese in mid-2013. We count everything baseball and here are a couple of unique statistics for you to ponder. This just goes to show you how difficult it is to be a .300 career hitter. In an era of pitch counts, set-up men and closers, here’s an account of a starting pitcher who went the distance – all 18-innings! A look back at some of the power hitters from the New Orleans Pelicans. I was surprised to learn that Cobb spent any time at the helm of the Tigers, and not with the type of results he produced as a player.